Nottingham Forest were apparently the first football club to be known as "The Reds" when in 1865 they started playing in red caps, this of course was in the days before jerseys became regulated, interestingly it wasnt just any red either, it was Garibaldi Red, so named after an Italian freedom fighter. They have of course also been known as "Forest", no guessing why !! 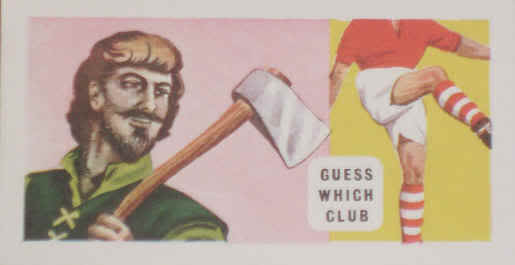 The football club also used the nickname "The Foresters" for a short period as mentioned on one of the cigarette cards shown below. "One of the oldest clubs in the country, Nottingham Forest was founded nearly seventy years ago. They have a fine record, and have once won the Cup. At the start they played on Forest Recreation ground, introducing football instead of a game called "Shinney." Previously the ground had been covered with trees, which formed part of the historic Sherwood Forest, and it was through this connection that they took their name. They soon came to be known as "The Foresters" and they are always depicted as one of Robin Hoods famous band of adventurers". "The "Foresters". So called presumably on account of the clubs own name. One of the original sixteen members of the First Division, this team has made rapid progress during the past few years and has secured a place in the First Division once again." Both of the cards above can be purchased on this site. 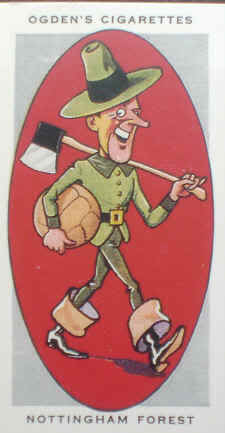 The cartoon above is Paninis take on the Nottingham Forest football nickname, this character was part of the Panini 86 sticker series. Again, this sticker can be purchased on this site where it has been mounted in a clear fridge magnet.